﻿ How do I check the optical signal strength of an SFP optical module? As we all know, SFP optical modules support a variety of applications, such as Fiber Channel (FC) switches, SONET / SDH networks, Gigabit Ethernet, high-speed computer links, CWDM and DWDM interfaces. When the SFP+ module and the switch are connected, the optical signal strength is the key parameter to ensure the normal operation of the whole connection. This article describes the optical signal measurement method for SFP optical modules and how to view the optical signal strength of SFP optical modules. In general, the signal strength of the SFP optical module includes both Tx power and Rx power, the former representing the transmit power signal, which represents the received power signal. For general SFP optical modules, the values ​​of Tx and Rx power indicate that the SFP optical module is working properly within a specific plan. 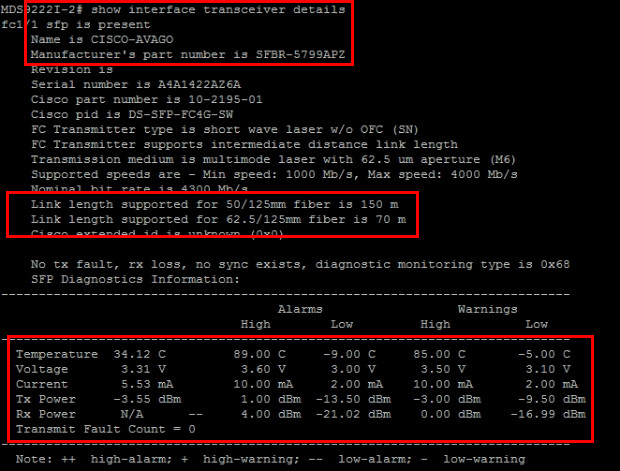 Taking the Cisco GLC-SX-MM optical module as an example, the transmit power is planned to be -9.5 to -3 dBm and the received power is planned to be 0 to 17 dBm. If Tx or Rx is within -30 dBm or less, it indicates that no signal has been sent or received. The strength of the optical signal directly determines whether the network connection is normal. If the Rx power is not strong, there will be no signal in the optical link. This is why the long distance optical module or optical amplifier needs to be used for long distance transmission. If the Rx power is too large, the SFP optical module will be damaged, so choose a high-quality SFP optical module is to ensure that the network connection can be the basic guarantee of normal operation. Third, how to check the SFP optical module optical signal strength? 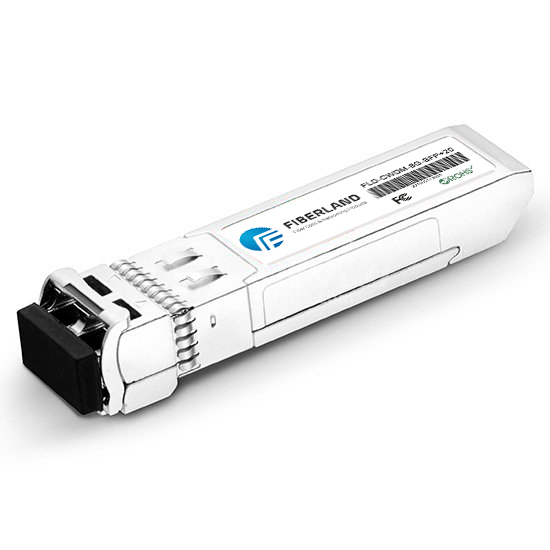 To determine whether the SFP optical module (transmitter and receiver) operates at the appropriate signal level, you can view the SFP optical module information, which is critical, including fiber type, transmit optical power planning, and optical reception power. 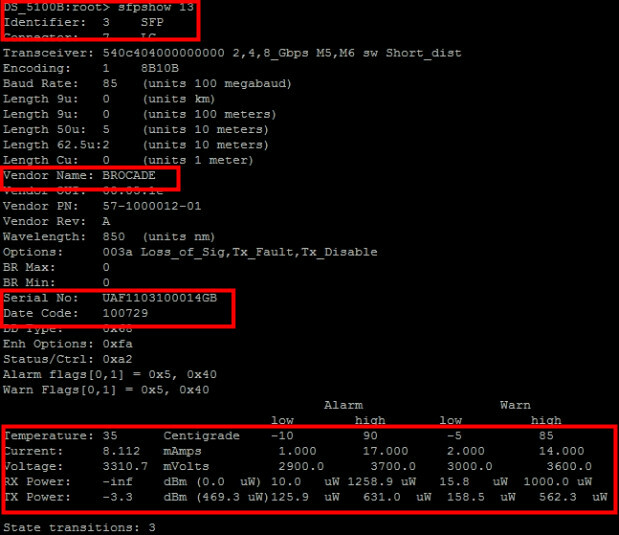 Other switches, such as Cisco and Brocade SAN switches, are available in the CLI (Command Line Interface), which is used to view detailed information about SFP optical modules, including rate, serial number, part number, and receive / send direction optical signals strength. The following picture flashes detailed information about SFP optical modules in Cisco and Brocade switches, including optical signal strength. As can be seen from the above results, although Cisco and Brocade measure the optical signal strength of different methods, but they are supplied SFP optical module at the time of signal strength and useful optical signal strength planning. As long as the signal strength of the SFP optical module is within the useful plan, the SFP optical module can operate normally.